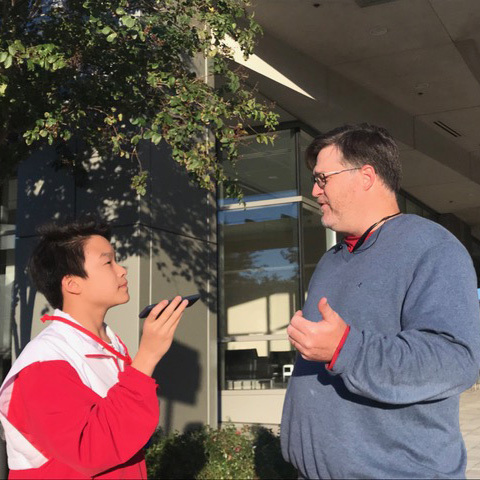 A Tight Race in Texas | Kid Reporters' Notebook | Scholastic Inc.
Benjamin talks with voter Trey Kell in Harris County, Texas. As most polls had predicted, Texas Senator Ted Cruz, a Republican, won his bid for re-election to the United States Senate. Cruz defeated Democratic challenger Beto O’Rourke. Few people anticipated, however, that the margin of victory would be so narrow. With more than 8.3 million votes cast statewide, Cruz won by about 220,000 votes. This heavily Republican state has not seen such a close race in more than 40 years. Nationwide, the midterm elections saw historically high voter turnout—the percentage of registered voters who actually cast votes. In Texas this year, the number of early voters alone surpassed the total number of voters in the 2014 midterms. Many political experts suggested that the high turnout was partly a pushback against President Donald Trump’s policies. Historically, the president’s party loses ground in non-presidential election years. In 2010, midway through Barack Obama's first term in office, his fellow Democrats lost 13 seats in the U.S. House of Representatives and 9 seats in the U.S. Senate. This year, following a similar trend, Republicans lost more than 30 seats in the House, giving away their previous control of the Congressional chamber. Republicans did manage to pick up a few seats in the Senate. On November 6, the day of the midterm elections, I visited a polling place in Harris County, which includes the city of Houston. Dozens of voters were waiting outside the one-story community center. Inside, there was a hum of activity. When I asked voters what motivated them to go to the polls, a common theme emerged: They were seeking change. “I came out here today because I want to be part of a difference,” said Miguel Rodriguez. Others said that they wanted to be heard. “I have a voice, and voting gives me the ability act out that voice,” said Jordan, who did not want to provide her last name. “I think that we can show what we’re feeling and what we’re thinking by voting,” said Trey Kell, secretary of the Democratic Party for his precinct. With Democrats gaining control of the U.S. House of Representatives, he is eager for change. “I hope Democrats slow down the rollback of some of the losses in our health care coverage,” Kell said. He also wants the party to limit President Trump’s power, something that Republicans have been reluctant to do. As for O’Rourke, many supporters have said that the charismatic candidate from El Paso should run for president in 2020. Political analysts have pointed out that O’Rourke’s ability to nearly turn Texas blue may bode well for him in a future presidential campaign. At the start of the campaign, O’Rourke, who represented El Paso in the U.S. House of Representatives, insisted that he had no plans to run for president. However, in his farewell speech on Election Day, he indicated that his political life was not over.